Mechanical Micro Drilling (MMD) process is a conventional micro-machining process used to produce micro-holes on various engineering materials. 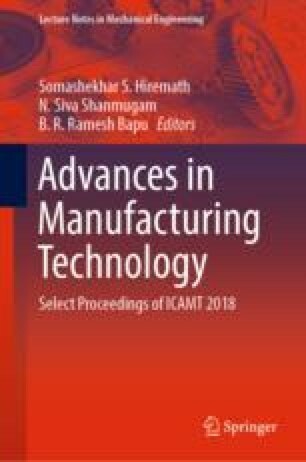 This paper investigates the optimal machining parameters required in MMD Titanium alloy—(CP-Ti) grade II. Grey relation analysis (GRA) is used for optimizing the process parameters such as spindle speed and feed for responses such as thrust force, diameter variation in entry and exit (DVEE), and exit burr height. Full factorial design with three levels of spindle speed (8000, 11,000, 14,000) rpm and feed (5, 7.5, 10) µm/rev was considered for experimentation. Solid carbide drill bit of ϕ300 µm was used to machine a hole in dry condition on 1 mm Titanium alloy—(CP-Ti) grade II sheet. The grey relation grades (GRG) was calculated for all the experiments, and responses were recorded. From the response table, the optimal parameters for multiple responses were obtained at a spindle speed of 11,000 rpm (Level-2) and at a feed 5 µm/rev (Level-1), respectively. Analysis of variance (ANOVA) on GRG was carried out, and it is observed that both spindle speed and feed are significant on multiple responses.